Ankle arthroscopy is a ‘keyhole’ surgical technique that allows us to look inside and see the surfaces of the ankle joint and proceed to some treatments there and then. It involves the insertion of a 3-5mm camera into the ankle along with various micro-instruments. Various treatments are described later. Lateral Ligament Reconstruction of the ankle involves open surgery to the outer side of your ankle. The damaged ligament/s are then deliberately cut before being gathered / reefed up, oversewn and anchored down to reconstruct their function. The procedure was originally described by Surgeons Brostrum & Gould. We now use some modern ~2.5mm metal pegs to anchor the repair to the bone, thus modifying this further. This technique is designed to improve the stability of your ankle. It is not used to help a stable but painful ankle. Arthroscopy & its Treatment procedures. Once the scope is in the joint it is inspected and any damage and areas of normal are usually photographed for keeping in your medical notes. This ‘diagnostic’ procedure can be just as important as any subsequent treatment for the information it provides. This occurs in over 90% cases and involves the shaving and removal of scar, synovitis or loose tissue that is felt to be symptom related. Synovitis is inflamed soft tissue that appears like ‘seaweed’ attached to structures and when entrapped can cause pain. It is very variable whether the synovitis is the cause of the problem or a painful result of another more mechanical issue. Either way, shaving it away can often make a very positive difference to pain and swelling. Removing this tissue also allows us to see into the joint more easily improving the accuracy and ease of further procedures. This is the technical name for grinding or ‘Burring’ away prominent and abnormal ridges of bone (Osteophytes). Occasionally pieces of these extra bone can break off and become ‘loose bodies’ within the joint which can also be removed. If they are large then larger scars can be required to achieve this. Loose cartilage cannot be stabilised or repaired. It is cleared back to the good adherent, stable cartilage leaving the discrete patch of exposed bone underneath. If left this would not just heal so is treated with microfracture. Bony prominences resulting in impingement. A curved incision about 5cm long is made directly over the ligaments on the outer side of your ankle. Local nerves are looked for and held out of the way. Gould – A nearby thin layer of tissue (Extensor Retinaculum) is dissected out and drawn up and over the Brostrum repair as an extra layer of support. This is performed as a Daycase procedure under a General anaesthetic unless there are medical reasons to avoid this. It takes about 1.5 hours to do. Experience has shown patients leaving the hospital about 4-6 hours after their surgery. You will wake up with a plaster cast (Backslab) put on below the knee leaving just the Toes exposed. Ensuring you stay hydrated whilst at rest. After the operation your ankle should be comfortable as local anaesthetic will be used in the operation scars. This will wear off after 6-8 hrs. You will then need painkillers. Tablets should be sufficient but take them regularly for 24-48hrs as the surgery pain settles. Your ankle will swell up initially. As a guide it should be elevated for 45-50minutes of each hour over the 1st two weeks. Occasionally you may have some soreness or even bruising in your thigh where we have used the tight tourniquet for your operation. This pain will usually settle. The dressings and Cast should be left alone. Yes. As a standard we use an absorbable suture (Vicryl rapide) that disappears in time and should be left alone. Can I Walk On it Afterwards? NOT Initially - You should only touch your toes down for balance whilst you are in the plaster cast. At 2 weeks you will receive a plastic, Velcro strapped boot (Aircast / Beckham Boot). From then on you will be able to walk full weightbearing as comfort allows. In the cast you should not move the ankle. Once you are in the boot you will receive specific instructions from the physiotherapists with regards to ankle movement exercises. The boot is to be worn during the day whilst active and whilst in bed at night. It can be removed at rest, whilst bathing and for rehab. Exercises. What is the rehabilitation going to involve? The physiotherapy rehabilitation of these procedures is all important and adherence to the instructions given during the pathway even more so. The team will regularly treat and assess your progress after the surgery for 3-6 months. This will be lead by the physio team and they will meet and explain everything along your rehabilitation journey. 0 - 6 weeks are a Recovery phase during which the main principle is to allow the wounds, stitches and ligaments to heal. This means protecting the ankle whilst trying to maintain range of motion and muscle function . 6 - 24 weeks you will enter the Rehabilitation program with the Physios. This involves weaning out of a small stirrup brace and working on ankle stability exercises much like those undertaken before the surgery. This lasts for 3-6 months to achieve the full result. It is sensible to continue with these around sports especially lifelong. A copy of the physio rehab program is available upon request. Will I be seen again after the surgery? At 2 weeks :- You will have an appointment to check the wounds are healing . You will then convert from the Cast to the Boot. At ~6 weeks:- You will have an appointment to assess progress with respect to surgery pain and to consider progression from recovery to rehabilitation. The exact nature of this depends on the individual surgery done. You will receive an ankle brace from the physiotherapists. At ~3 months:- You will be seen to assess the on-going rehabilitation of the surgery and look to your expected outcome. This will commonly be your final planned appointment. Infection – Any incision through the skin carries this risk and it is looked for specifically at the 2 week check outpatient appointment. A skin infection will usually settle with tablet antibiotics but a joint or bone infection, though extremely rare is very serious and can result in disability and compromise of the surgical result. Nerve damage – The incisions pass very near nerves which are held out of the way. They can respond even to this handling with some temporary tingling or numbness that will settle. Rarely a neuroma / accidental injury can cause longer term nerve symptoms with loss of sensation in the foot or a more complex pain reaction. Tendon damage – Whilst ‘keyhole’ the incisions into the ankle pass very near tendons and occasionally these can be damaged causing pain and extremely rarely subsequent rupture. You would experience this as a weakness of ankle movement so alert this to the team if noticed. Should a rupture happen you may require reconstructive tendon surgery to correct it. Recurrent pains – Arthroscopy has its limits and occasionally the damage progresses and becomes increasing symptomatic with time. As yet we have no cure for general joint arthritis / damage. Dissatisfaction – The evidence to date has shown an overall satisfaction with the various indications from 65-90% with this surgery. It is designed to improve the situation. The ligament surgery however has a much more like 90-95% success rate of achieving stability. This drops off though in people with generalised ligamentous laxity. 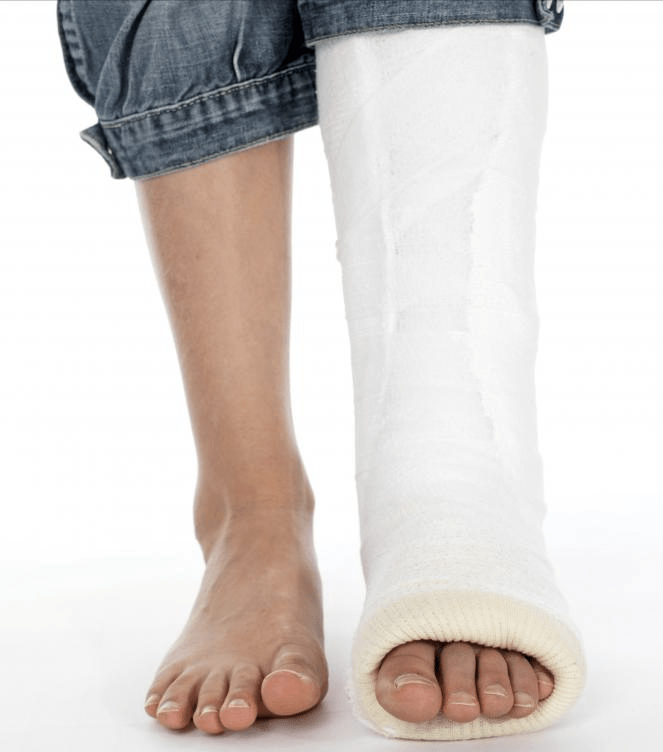 Thrombosis - Following ankle surgery and particularly whilst you are in a plaster cast you are at increased risk of developing a blood clot (Thrombosis /DVT /Pulmonary Embolism) in your legs. To mitigate against this you should Stay hydrated, wiggle your toes, move your knee and use a TED stocking on the other leg. You will also receive a course of injections (Clexane/Enoxaparin) to thin your blood slightly during the period you spend in plaster cast..
Stiffness – During the stabilisation your ligament is deliberately tightened up and this creates initial stiffness. This will usually resolve with the rehabilitation but occasionally can persist long term. Re-rupture – The scar tissue ligament that forms following the surgery is likely to always be a little weaker than the one you were born with. If stressed again too much it could re-rupture. A more complex reconstruction using tendon graft donated by your own ankle/knee. (e.g Chrisman-Snook). This is usually reserved for revision cases.